Every other Tuesday morning you will find CCA’s staff huddled around a table as Pastor Mark teaches, encourages and develops us to be the best pastors, leaders and followers of Christ we can be. A couple months ago he announced that he wanted each of us to create our own leadership lesson to teach, encourage and develop the staff. And so we did. Edited 10-24-12: You can click here to read the post "What Maggie Meant"
As I finished up my lesson I added one last thing. I told the staff that it is imperative that we as Christians know the Bible and never stop studying it. Not just because it is the foundation of all we believe, but it is LIFE to all who read it. So as 2012 is coming to an end I want to encourage you to take 15 minutes a day to read through the Bible with the staff beginning January 1, 2013. Monday thru Friday one of our staff members will be posting a short blog about that day’s reading and we encourage you to GROW through 2013 with us!! Many of you are reading the Bible with me already this year and I invite you to do it again next year. Every year I read through the Word new seeds of truth are planted in my heart. 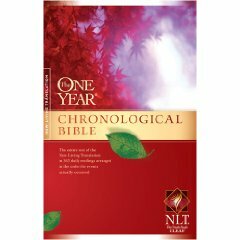 So if you are ready to take this challenge here is what we are going to read, The NLT One Year Chronological Bible. It is the BEST one year Bible I have found. It puts the events of the Bible in the order they actually occurred making it feel more like a novel than 66 separate books. So with just a little over two months left in this year I wanted to encourage you to go ahead and order your Chronological Bible or download it to your eReader. To order the Bible click here. To download it to a Kindle or Kindle App click here. And on December 31, 2013 we will have read all 66 books, 1189 chapters and 31,103 verses of the Bible!! LIFE, it’s in the Word.